Dispense with all the wires! 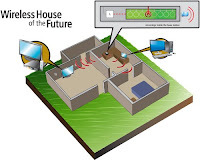 The wireless house of the future might use a system being developed at Purdue University that could eliminate wires for communications in homes, businesses and cars. The researchers designed and built a miniature device capable of converting ultra fast laser pulses into bursts of radio-frequency signals using innovative "microring resonators." Such an advance could enable all communications, from high-definition television broadcasts to secure computer connections, to be transmitted from a single base station. (Purdue University, Michael Esposito). WEST LAFAYETTE, Ind. — Purdue University researchers have developed a miniature device capable of converting ultrafast laser pulses into bursts of radio-frequency signals, a step toward making wires obsolete for communications in the homes and offices of the future.